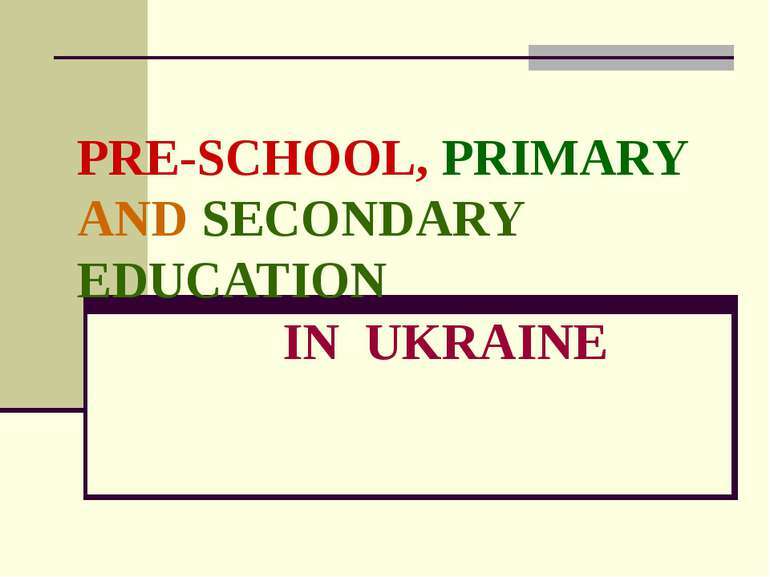 Pre-school education: Nursery schools or kindergartens Most parents take their children to nursery schools or kindergartens at the age of three. 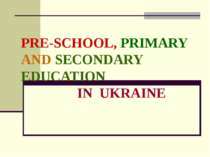 The children usually spend all day long there. At the age of 4-5 they are taught to count, read and write the letters. 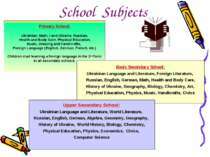 They also have the lessons of Drawing and Handicrafts. 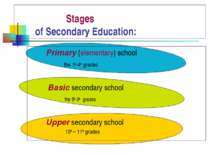 Sometimes they learn English too. 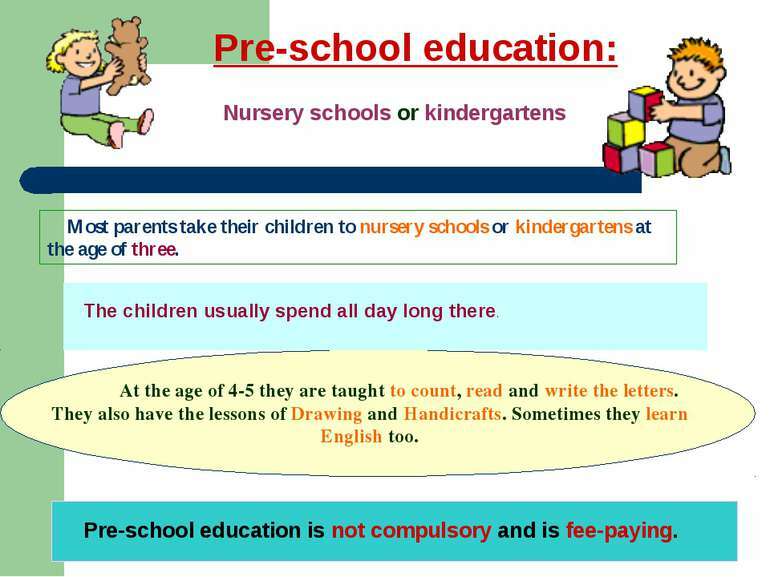 Pre-school education is not compulsory and is fee-paying. 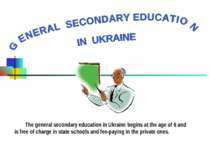 The general secondary education in Ukraine begins at the age of 6 and is free of charge in state schools and fee-paying in the private ones. 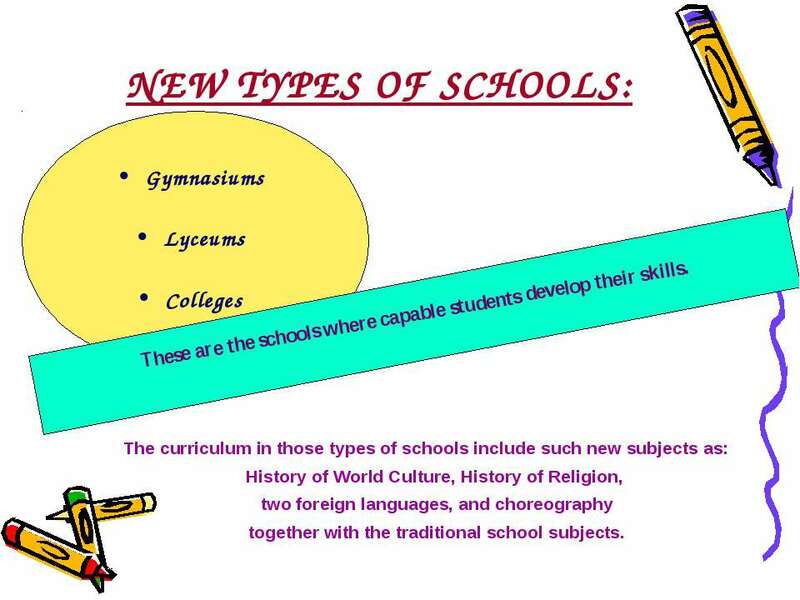 NEW TYPES OF SCHOOLS: Gymnasiums Lyceums Colleges These are the schools where capable students develop their skills. The curriculum in those types of schools include such new subjects as: History of World Culture, History of Religion, two foreign languages, and choreography together with the traditional school subjects. 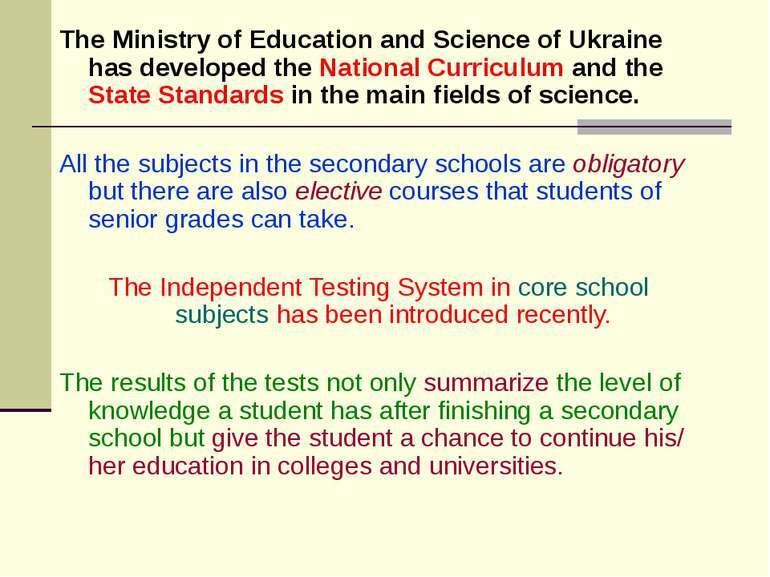 The Ministry of Education and Science of Ukraine has developed the National Curriculum and the State Standards in the main fields of science. 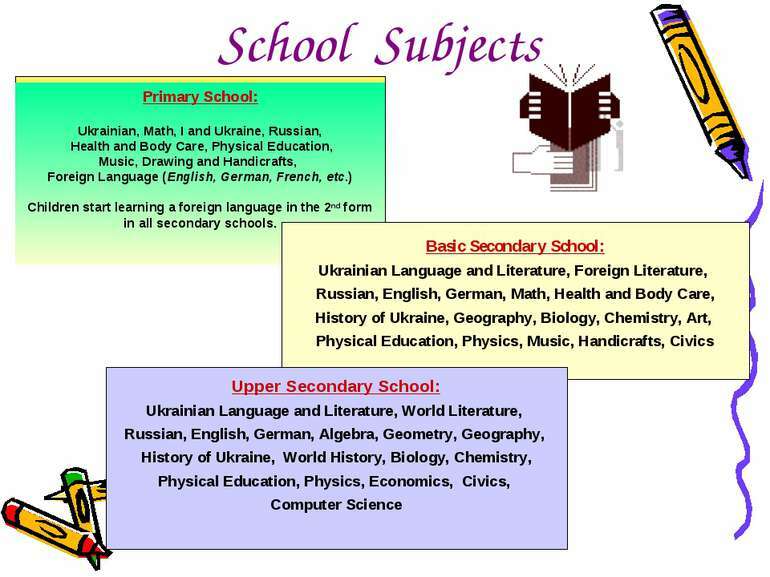 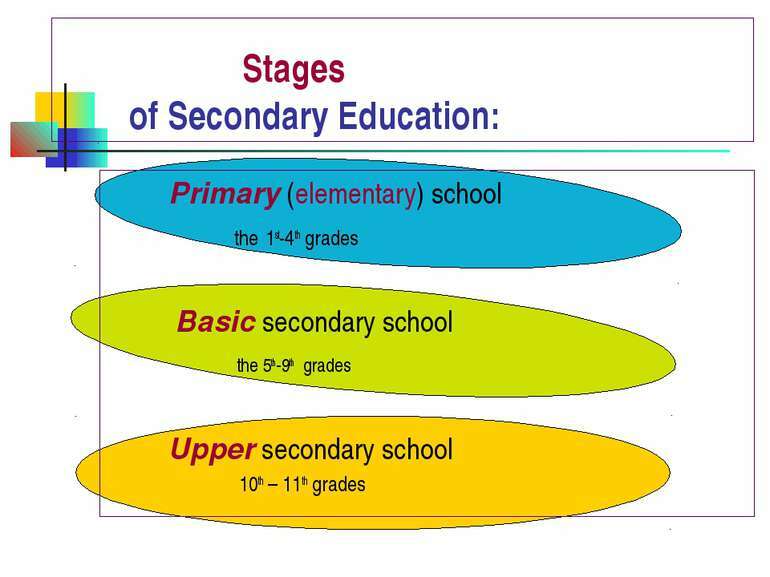 All the subjects in the secondary schools are obligatory but there are also elective courses that students of senior grades can take. 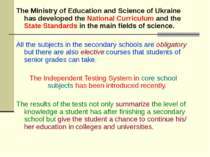 The Independent Testing System in core school subjects has been introduced recently. The results of the tests not only summarize the level of knowledge a student has after finishing a secondary school but give the student a chance to continue his/ her education in colleges and universities.